The other day I ran a workshop which was about making things physically, and making things digitally, and thinking about the differences between the two, and the ‘affordances’ of different ways of making. It was at the most excellent Winchester Discovery Centre, which is a library and event and exhibition space in Winchester, UK. I was superbly helped by the Discovery Centre’s amazing Gilbert Yates and Francesca Reid. 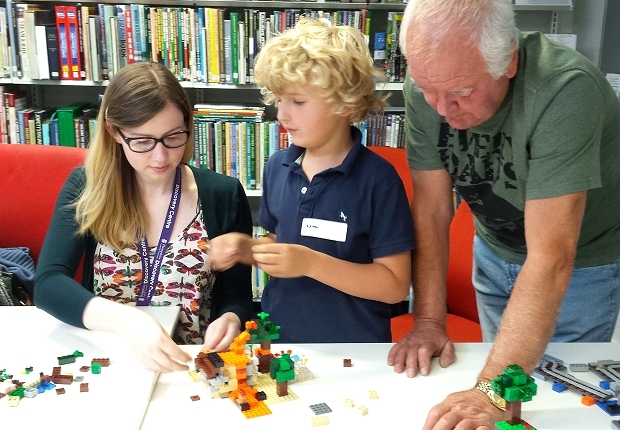 The headline thing-to-do was that participants would be able to build a LEGO Minecraft world, using lots of actual LEGO Minecraft sets, as well as being able to play Minecraft on iPads. (If you need notes: Minecraft is a fantastically popular digital game in which players can build whatever they want, within a blocky kind of world, inspired by LEGO; and in turn, LEGO eventually formed a partnership with the Minecraft people to make LEGO Minecraft sets, which offer quite a ‘back to basics’ version of LEGO where you get lots of blocky bricks and you’re meant to make whatever you want). As well as that I wanted to have other physical and digital creative things to compare and contrast, and a month or two earlier I was having some vague ideas about including some music-making activities when I met Russell Richards, musician, artist and academic, who had wondered if we might collaborate on anything. I thought this might be a good starting point and asked if he might like to sort out ‘the music table’ for this event. And so it happened. To my delight, Russell duly came all the way from the Isle of Wight, where he lives, with digital music-making things (including an iPad with Leap Motion sensor) and physical music-making things (including a bunch of mini Pringles pots for percussion and, er, a bunch of other things from his kitchen). So that was an unexpectedly generous and brilliant bit of bonus collaboration. So this whole event was a ‘work in progress’ kind of thing – a way of getting more ideas and experience and information about how people feel about physical and digital making. It was very nice to do. I need to do more of them, and other things like it, before it adds up to something, but it was great to make a start. The workshop was invigorating because it wasn’t really part of any particular project. (It feeds really usefully into my thinking and research for two funded projects, Digital DIY and Digital Folk, in fact, but it’s not formally a part of them and was not mentioned in their application forms). Often when I’m doing stuff for funded research projects, the plans for them have been carefully written down some years previously, and it doesn’t seem especially dynamic. Basically I never like having to do what I’m told, even when the directions are only coming from a previous edition of myself. So this more ad hoc, fleet of foot kind of workshop was more refreshing to do. I’m also quietly testing my theory that research methods, essentially, get in the way, and that if you really want to learn something you have to set up a platform where people can do things and then let it happen. If this sounds like lazy nonsense spouted by someone who doesn’t want to have to think properly about research methods, then, well, you can think that if you want, but I have written whole books about research methods, and so now I feel entitled to consider the more unusual view that formally organised research methods are often just clutter that get in the way of real experiences. This is not an argument against doing research, or for purely ‘armchair research’. As you can see in – for example – this case, I set up a whole event, with quite complex logistical and equipment requirements, to see what happens when you give people the opportunity to play and experiment with different tools and materials. I did even ask them to write a little bit about each of the kinds of experiences at the end of the session – conventionally enough. But overall I think the event benefited from its free-flowing format and the fact that I wasn’t asking very particular questions – or that I wasn’t doing so very noticeably. So I’m not saying you don’t need research methods – of course you do – but you have to keep everything simple and subtle or you just spoil the whole thing. I increasingly notice in proposals by potential PhD students, and in actual published studies, that anything put in to make a study “more rigorous” almost always has the opposite effect, by crushing the meaning and the life out of whatever would otherwise have been going on. The other key thing about this event was that it was in a library. The idea of libraries as platforms for creating new knowledge, not just repositories of existing knowledge, is something I’ve written about before (see for example ‘De Chocoladefabriek Gouda – Making is Connecting in action‘ and ‘Platforms for Creativity: Introduction‘ and ‘Museums and libraries as platforms for creativity‘), and obviously this builds on those themes. I’m also doing a talk and workshop at Chicago’s central library next month – because the Chicago library system is pioneering the combination of libraries and making. Libraries as platforms for creativity is a really rich theme to explore.